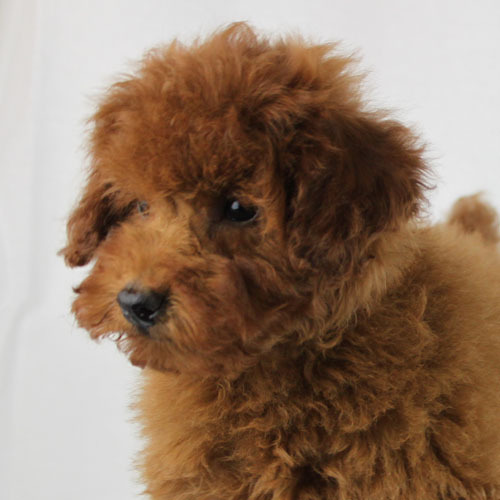 Adorable red poodles sport lush, curly hair that contributes to their “wow factor.” Poodles comprise one special breed that demands attention with gorgeous coats and spunky personalities. However, poodle fur does not stay fresh on its own; brushing your poodle’s hair is vital to both their health and well-being. Red poodles sport thick, curly hair requiring much attention and maintenance to keep clean and healthy. When poodles shed, their curly hair traps the loose hair, and the shed hair then develops into mats and tangles. Brushing your poodle every two to three days helps keep their fur mat and tangle free. Brushing your poodle also lets you check their hair for anything that might be poking their skin, such as dirt or debris. During a brushing session, you can also check for fleas and ticks. Brushing your precious red poodle will keep their fur clean and polished, ensuring they are healthy and happy. You need the proper tools to thoroughly clean your red poodle’s fur. Start with a slicker brush to tackle mats and tangles and to remove the loose shed hair. Use a bristle brush to brush out the detangled and de-matted hair. You may also need some grooming scissors to remove larger tangles and mats. Keep an eye on your furry friend while brushing to make sure the brush is not too hard or intense for their skin. If you notice mats developing soon after brushing, you may need to try a new brush that penetrates completely through the coat. As playful, happy-go-lucky creatures, poodles enjoy playing outdoors. Long periods of damp, humid weather can lead to matting in your red poodle’s fur. Poodles that get wet and dry without brushing are susceptible to mats. Paying attention to your pup when they come in from the outdoors will help you determine if they need a quick brushing session. When poodles grow up, their coat changes from puppy to adult texture, going from fine to coarser hair. Brushing your red poodle every day is important for avoiding mats and other fur complications. Find the poodle of your dreams at Scarlet’s Fancy Poodles to your family.